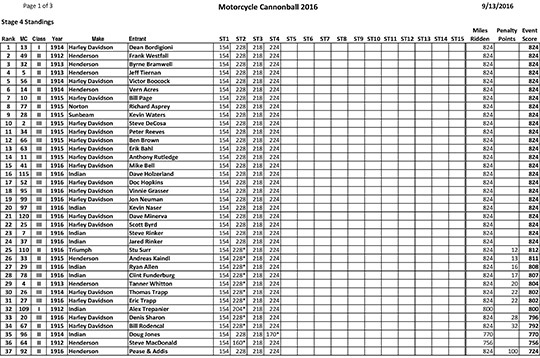 2016 Cannonball Race Of The Century. 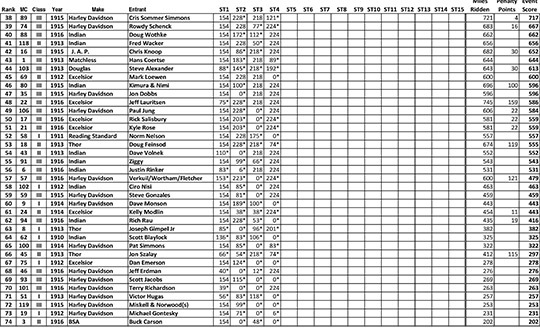 Stage 4 Results. Published by Cyril Huze September 14th, 2016	in Editorial and Events. 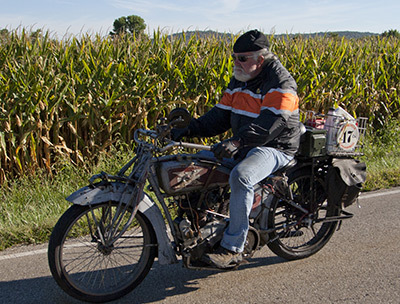 (With the contribution of Felicia Morgan) Tuesday morning’s starting line in Chillicothe, Ohio saw 70 Motorcycle Cannonball riders anxious to hit the wind and change their ranks on the score sheet of daily miles across these great United States. Seeing the country one State Route at a time is exciting enough, but on the back of a 100-year old motorcycle is simply an experience unto itself. 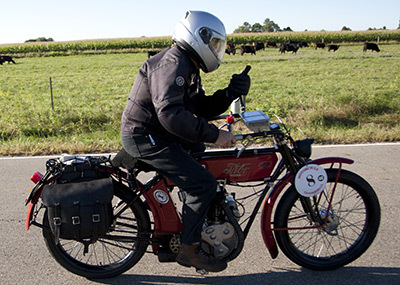 Not too many people can brag about having made a coast-to-coast trip on two wheels, let alone on a century old motorcycle and every rider on this run is well aware of the historical significance of the undertaking. 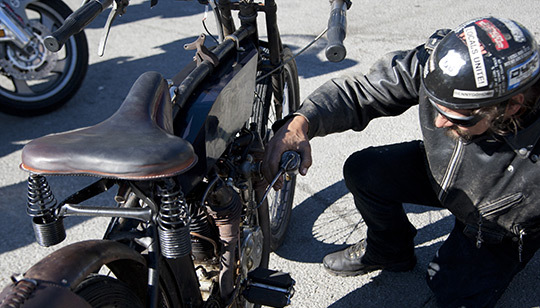 New Jersey resident, Jon Szalay sat in a gas station parking lot oiling parts on his 1913 Thor when he told us that he was crossing America “one quart of oil at a time” as his bike sat with a puddle of oil underneath it. “Yep, this is the USS Motorcycle Cannonball Valdez,” he quipped as his friend and fellow rider from the Thor Losers team, Doug Feinsod, made adjustments to his own 1913 Thor. 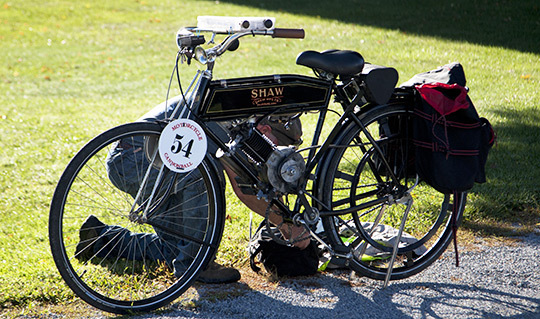 Both the 1904 Rex and the 1913 Shaw struggled with the hills and eventually came off the road before crossing from Ohio into Indiana. The route continues to be an issue for both the riders and their machines since 200 miles or more per day is asking a lot from these geriatric motorcycles, but most seem to have the bugs worked out. The sweep trucks spent the day wondering where all their buddies have gone. It was a long and lonely day for sweep drivers and they didn’t mind a bit. 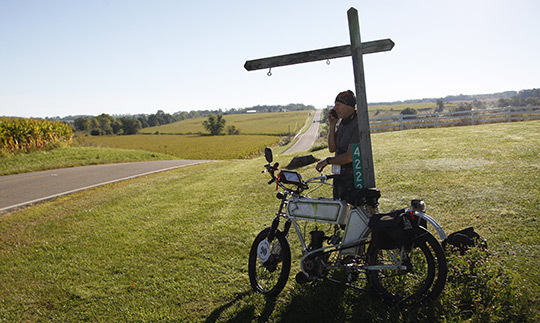 Today will see riders rolling into Missouri for a street party in Cape Girardeau after a whopping 247 miles. Much admiration for all the passionate riders and team members involved. Speedy recovery, Scott Jacobs.